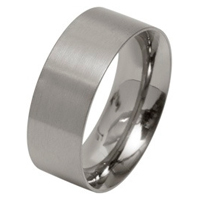 All of our Titanium Rings & Titanium Wedding Rings will be dispatched in our slim unbranded box when either free delivery, or 1st class delivery are selected as your delivery option. The slim ring box allows us to dispatch the titanium ring in a smaller parcel helping us to maintain a free delivery and subsidised 1st Class Recorded Delivery. All of our titanium rings & titanium wedding rings will be dispatched in a titanium branded ring box when Special Delivery or International Delivery are selected. Please note that we are unable to offer the branded ring box if you select Free UK Delivery or 1st Class Recorded Delivery, as the branded box exceeds the 25mm limit set by Royal Mail.